Remote measuring with a Handyscope series oscilloscope with an ethernet connection (LAN, WiFi or WAN) is so transparent that it appears that the ethernet connected instrument is connected directly to the PC. All software and hardware features of the oscilloscope, spectrum analyzer, data logger and voltmeter remain available via the network. Specific network knowledge is not required. The Multi Channel oscilloscope software supports ethernet connected instruments by default. The dialog with available instruments shows the network instruments. Simply place a tick and measuring can start. An ethernet connected instrument consists of a standard TiePie Handyscope series instrument, connected via USB to a computer that is connected to the ethernet network and is running the TPISS Instrument Sharing Server. This computer can be any Windows based or Linux based (embedded) computer with at least one USB connection and a (wireless) ethernet connection. When the TPISS Instrument Sharing Server is installed and running on that computer, all connected instruments will be opened by the server and then shared via the network. Figure 1: A Handyscope HS6 DIFF, shared via a Raspberry Pi running TPISS, powered over ethernet. The Instrument Sharing Server computer can be connected to the local network, but can also be located on a remote location, connected via internet. 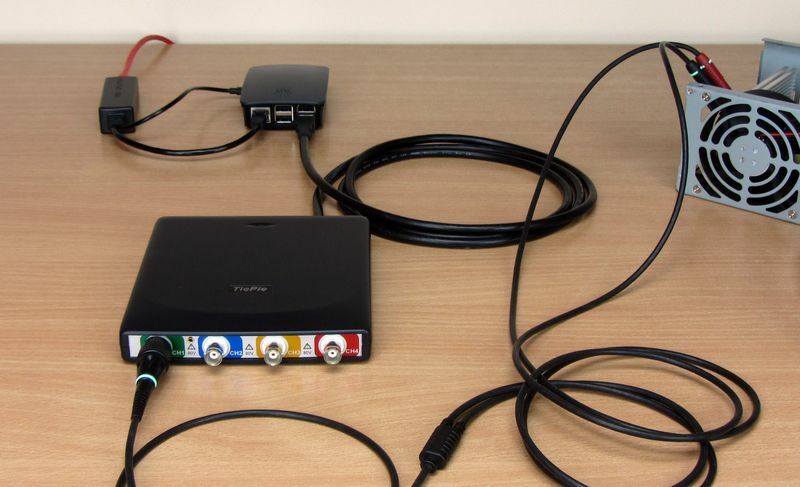 Read more on transforming a USB scope to a network oscilloscope. 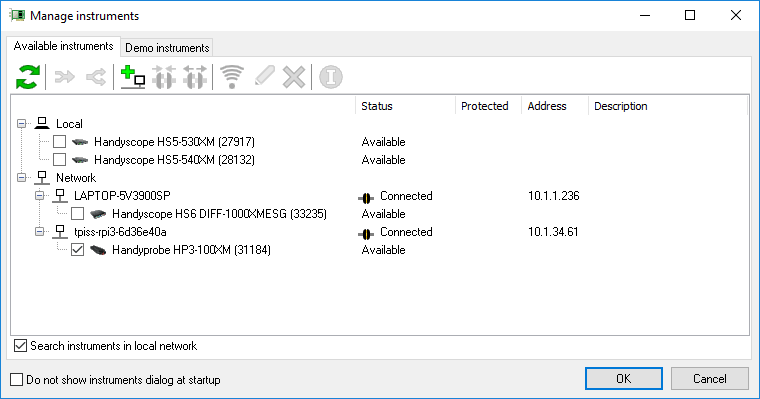 When network search is enabled in the Multi Channel oscilloscope software, the Manage instruments dialog will show all detected Instrument Sharing Servers and their connected instruments. To open a remote instrument, simply place a tick in front of the instrument and the Multi Channel oscilloscope software will open that instrument. It can then be used in the same way as a local connected instrument, all hardware and software functionality is available. No difference with a local instrument will be noted.